Surprisingly a great jumping on point for new readers, this issue delivers on the action and gives us lots of great moments between the characters. The guest-appearance by Superboy helps add to the struggle these characters are facing and I’m loving the relationship (not a romantic one) that he’s developed with Cailtlin Fairchild. On top of that we get a great art tag-team with Ian Churchill & Tyler Kirkham. All around, a superb issue and one that reminds me why this is one of my favorite books right now. Ravagers as a book took a while to get its footing. But with the initial arc and Zero Issue month out of the way, I can tell Howard Mackie took the time to make this a new-reader friendly issue. He starts off with having some simple exposition from one of the characters that reviews each of the Ravagers’ names and their powers. You also get to see them in action too. Then we move on to something I love which is seeing superheroes chilling out in the real world. It’s something I’ve seen many times during my years of reading comics but it’s an idea that still appeals to me. And finally, for those who have been reading since the beginning get treated to the return of several characters at the end of the issue (including two minors ones I thought we’d never see again). I already love Ian Churchill’s art and have normally been disappointed when other artists have been brought in to help him finish an issue. But this time they brought in Tyler Kirkham to help and I like his art so it was a good compliment to Churchhill’s. Because of the three acts I mentioned earlier, we get treated to some great action art as well as the superheroes in the real world which the artists have some fun with. It’s also noteworthy this month that we get twice the Ravager-goodness as the team appears in Legion Lost #14 (which apparently takes place after Ravagers #7 next month). If you’re looking for more on the villain Harvest who originally created the Ravagers be sure and check out that book as well. 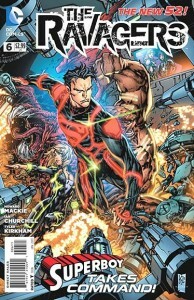 Stormwatch and Ravagers are my two favorite books right now. Ravagers once again narrowly beats Stormwatch for me this month. I’m just so happy with the direction of the book and I’m loving the interaction between the characters. All this and some beautiful art make for a winner in my book. 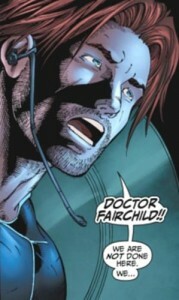 This entry was posted in DCU, Ravagers, Reviews and tagged fairchild, ravagers. Bookmark the permalink.